More cookies! These have a different taste because of the almond butter, and a different texture, a little more like shortbread. In our family we all agreed, YUMMY! …True confessions… I baked these little darlings late last night, had one, we all agreed they were YUMMY. This morning, came down to the kitchen, (luckily I sent most of the cookies to work with my husband) the remaining ones were calling my name. Now, I usually never have breakfast, just isn’t my thing but they(?) say it’s the most important meal of the day. 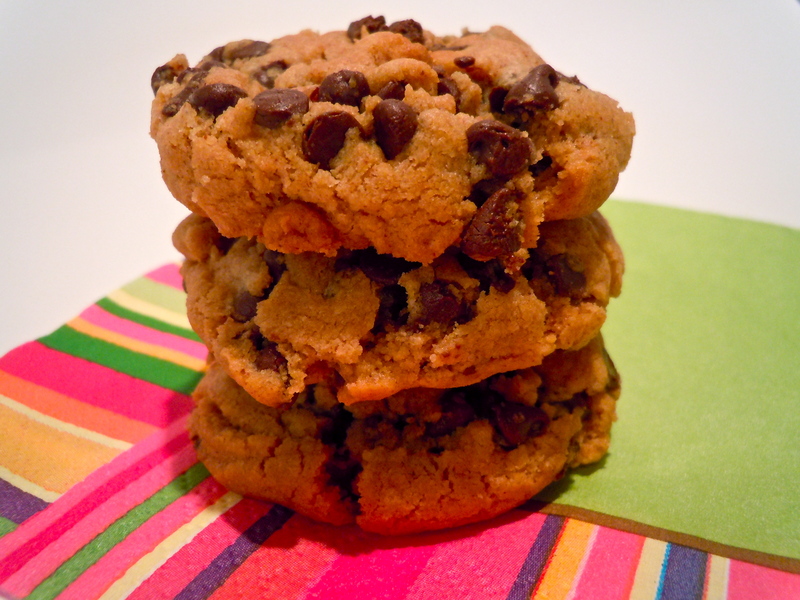 My morning brain is thinking…one cookie is a start on my path toward breakfast. I have a cookie, these could be an addiction, delicious, wow! (I do believe when my brain is fully warmed up it would think the same thing about these cookies) Until the Fam comes home and finishes off the cookies, it’s just too dangerous to be in the kitchen. I remove myself and go get on the elliptical. Preheat oven to 350°. Stir together flour, baking soda, baking powder, and salt in medium bowl. Using electric mixer, beat butter, almond butter, and both sugars in large bowl until light and fluffy. Beat in egg and vanilla. Beat in flour mixture. Stir in chocolate chips. Using cookie scoop, pack dough (it’s a bit crumbly) into a tight ball and set on cookie sheet. Bake until cookies are golden brown, about 12 minutes. Flatten slightly with spatula right as they come from the oven. Let cool on cookie sheet at least 5 minutes.